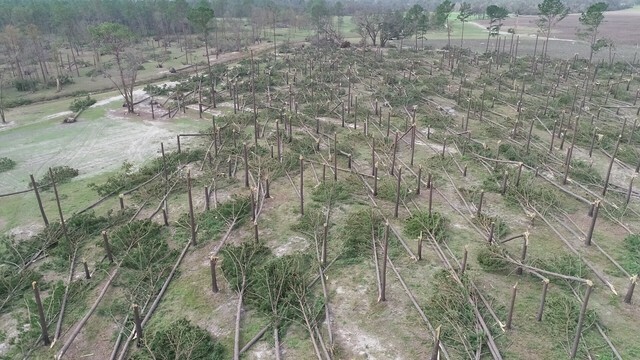 Mobile, Ala., (WKRG) - Hurricane Michael's impacts beyond life and property can be seen from the air- trees and timber. The Alabama Forestry Commission (AFC) estimates that timber losses in Houston County, Alabama, alone were over $20 million dollars. That for an area of forest that's over 42,000 acres. AFC recommends that forest owners quickly survey their property so that viable timber can be utilized. Timber that stays in place and drys will become fuel for wildfires. Damaged timber can lead to attack by insect pests like the southern pine beetle. According to AFC, Additional information regarding storm-damaged timber, as well as forest recovery efforts and programs available to private landowners, can be found at www.forestry.alabama.gov. There is also a link to a list of registered foresters on the website.